I’m willing to bet Martha Stewart’s office never looks like this, but for the rest of us, this may not be so hard to imagine. In fact, my office often looks about like this at the end of a particularly hectic week. Instead of taking the time to organize as I go, I get busy and things start to pile up, both literally and figuratively. 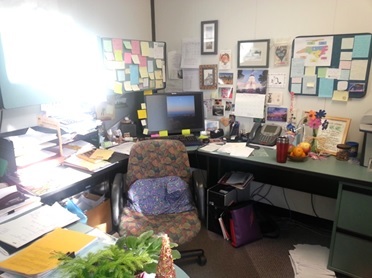 As a member of the Women’s Health Branch (WHB) Quality Improvement Council, I’m forever trying to get folks to drink the “QI Kool-Aid.” But on the days when my office looks like a hobo camp, I feel like a poseur. All that talk about efficiency and consistency is overshadowed by the mess. What we see around us every day sets the stage for how we feel about our work. A 2008 study looked at how people behave when their environment is messy or disordered. As you might suspect, the worse the physical environment was, the worse people behaved. This connection between our physical environment and our productivity and engagement gets to the heart of quality improvement. Workplace organization ultimately tries to achieve a stable, consistent and predictable workplace. This ordered environment improves visibility, control, efficiency and safety, which reduces both waste and costs. As with much of QI thinking, the accepted tool for workplace organization was developed in Japan. Numerous companies have adopted what is called the 5S, a mechanism for turning that disastrous office, closet or storage room into a functional workspace. Each ‘S’ is a Japanese word (and now its English equivalent) that represents a step in the practice.  Sort (Seiri) – Remove any unwanted/unnecessary items from the area.  Set in Order (Seiton) – Place the needed items back into the work area in an organized and efficient manner.  Shine (Seiso) – Clean! Inspect while cleaning. Make cleaning easier by creating “home” locations for cleaning supplies.  Standardize (Seiketsu) – Utilize visual controls and establish rules to control the first 3 S’s.  Sustain (Shitsuke) – Train and communicate the success of the 5S project so all potential users of the area understand. Use a scoring system as a visual control to protect the area from backsliding. In an effort to create some excitement around QI, the WHB decided to clean up spaces, both real and virtual, that we use every day. 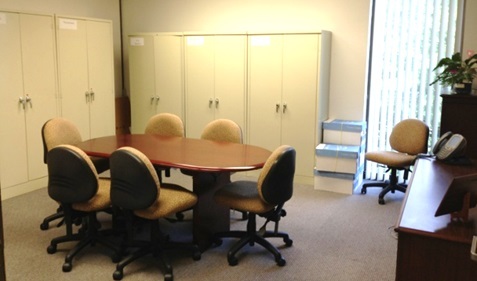 We started our efforts with a room that did double duty as a storage space and conference room. In this ‘before’ photo, you can only see half of the room. A makeshift wall of cabinets divided the room in two. Printer cartridges, paper boxes and other supplies were stacked everywhere – including on top of the cabinets. The conference table was crammed into a too-small space, and we had a difficult time getting chairs around the table. Needless to say, it was a bit embarrassing to hold interviews in the space. While organizing this space certainly felt like a mammoth job, we took a deep breath, channeled our inner Marthas, and started to sort. By getting rid of so many outdated materials (reams of data from 2002, VHS cassettes, etc.) we were able to eliminate some cabinets and move the remaining ones against the walls. With the makeshift divider now gone, we centered the table in the room, and brought in a small credenza. While we are still able to store plenty of materials in the room, we also find the room to be a comfortable space for meetings. This room makeover was such a drastic change, and I believe the ‘wow factor’ helped folks in the branch appreciate 5S and its role in QI. While this physical space was a breath of fresh air, we had a virtual space that needed some attention as well: our shared drive. In order to get buy-in from staff, I met with each of our three units and got input on the folder structure. The biggest challenge, by far, was determining who ‘owned’ the existing files and folders – and who had the authority to press the mighty Delete key. But these hiccups were minor and ultimately worth it. In addition to deleting the 81 free-floating files, we went from 178 to 22 top-tier folders – an 87.6 percent reduction! As the old cliché goes, cleanliness begets cleanliness. In a recent survey of our staff, 83 percent reported being confident that they could apply 5S organization principles to their home or workplace. 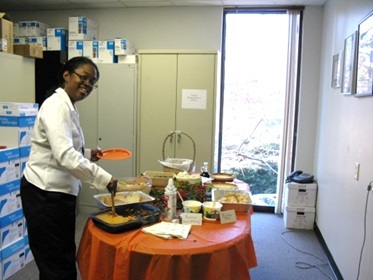 We’ve had several staff apply 5S to their offices, and many more who have shown interest. As with all big changes, sustaining is a challenge. It’s easy to fall back into our old habits, as I have done this week. As I’m looking at my desk, I see plenty of things that belong in a folder (meeting minutes, research briefs) or the recycle bin (scribbled post-its, a half-empty water bottle), and plenty of things that don’t belong here at all (my daughter’s shoes). But instead of giving in to the mess, I will take a deep breath and sort. Martha would be proud.